As the newly elected Vice President of the World, it’s time to do whatever the President asks you to do. The opposition leader isn’t satisfied with the results of the election, he’s started a smear campaign on the V.P. that has everyone riled up. Despite these problems he goes out of his way to help out the citizens with their problems. He’s embroiled in a mystery that includes strange animals wandering the forests, and coffee makers that attack the patrons. 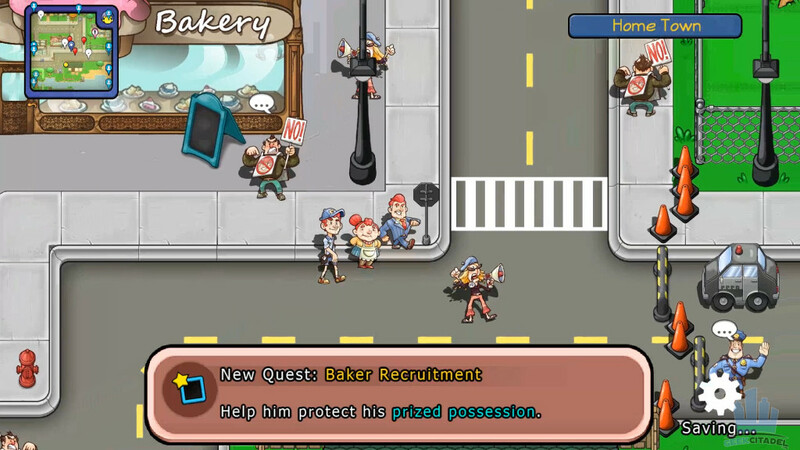 Earthbound Style – The creators of Citizens of Earth were clearly inspired by the great Mother/Earthbound series. It capitalizes on the visual presentation of minimalist first-person battles with text flowing above screen. It has its own sense of wacky characters from the over-the-top Vice President to the insane ramblings of the school mascot. Gotta Catch Em’ All – Even with the resemblance to Earthbound, the game has a distinct similarity to the Pokemon series. As the V.P. you’re set to push citizens around with your powerful ways. Your job is to meander about town running into wacky personas and recruiting them to do your bidding. Each citizen has their own set of skills and strengths and weaknesses. They can easily be swapped in and out according to the situation, so there is plenty of fun to be had with each. Great Voiceover – Every person in Citizens of Earth has a voice and they’re all great and capture the characters on screen wonderfully. Not every person has spoken dialogue in every situation, but the 75 percent that do sure are great to listen to. Pricing – Citizens of Earth is a full-fledged RPG that captures the 16-bit era of games perfectly. It’s hard to argue with the price of $15 for hours of JRPG fun… even if the game has some drawbacks. JRPG Essence – I like Citizens of Earth… but that’s about as far as I can go with it. It doesn’t really break any walls down for the RPG genre. It takes a lot of pride in its comedy which is hit and miss, but the recruiting of Citizens breaks down to the monotony of fetch quests. Find this, kill that, it’s all rudimentary after a few battles. Within two or so hours of playing, I was already bored of what felt like a “grind” and that’s just not right. Not only that, but the combat system is a little too basic for my tastes. It makes no attempts at differentiating itself from any other RPG that ever existed before it. I love Earthbound but somehow playing the same combat system in Citizens doesn’t have the same appeal. My only assumption to my feelings it that I remember Earthbound from 1994, and sadly it’s 2015 and I’d expect a staggering upgrade in the combat system by then. Load Times Vita – Loading is buttery smooth on the PC but the Vita takes some time to move in and out of buildings. It’s a 5 to 6 seconds difference, but it’s noticeable since you move through different zones constantly. Other than the loading issue, the games are virtually the same. Soundtrack – It’s not that I hate the Soundtrack per se, it’s just that it isn’t that impressive for an RPG. Seeing as this game was inspired by the Mother series, you’d think it could do a little better with the musical choices. Sadly, there were times where the music began to grate or simply cutout completely after a combat sequence. The world – Citizens of Earth has some great characters but the world is a bit too sanitary. The visuals are crisp enough to take a delicious bite out of, but the environments lack an artistic flair. At times I could confuse the design with that of a flash game. For a game that’s trying to capture the 16-bit essence, it lacks that artful variation that breathes life into different zones. The level design was clearly created for travel and not to stop to smell the roses. Can’t skip messages – There is one thing I can’t stand in RPG’s, and that’s not being able to skip arbitrary messages. You can’t do that in Citizens of Earth, you’re forced to listen to the V.P. make snide comments during battle and enjoy lingering messages of enemies dropping items. It’s a small little thing, but man if it isn’t an annoyance when grinding. 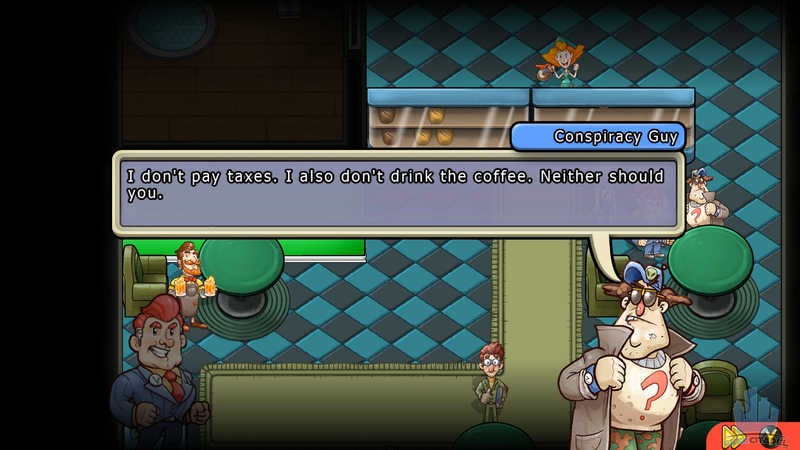 Comedy has a place in video games and Citizen of Earth does tickle that fancy completely. 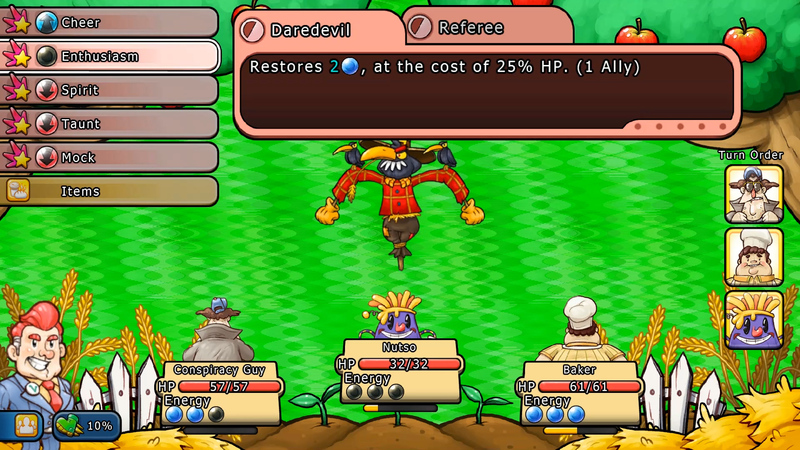 As an RPG… it tries to mimic Earthbound and Pokemon, but falls short of the heights that those two titles reached. I recommend you wait for a sale before becoming the Vice President of the World. Citizens of Earth emulates the Mother series closely, but fails to show its own heart in the process. I’m not saying it’s a bad RPG, but nothing about the story or the combat had me playing it for more than a couple hours a day.